ICE tour was organized this Monday October 22nd as part of the Congress in Evian. As part of the Global Bottled Water Congress organized by Zenith Global in Evian, an ICE tour was organized this Monday October 22nd. 38 delegates directly linked with the water industry or water treatment came to our premises in Chavanod. First, welcomed by Philippe Martin-Monier, ICE CEO, they discovered the different technologies developed by ICE with a commented tour of our factory. 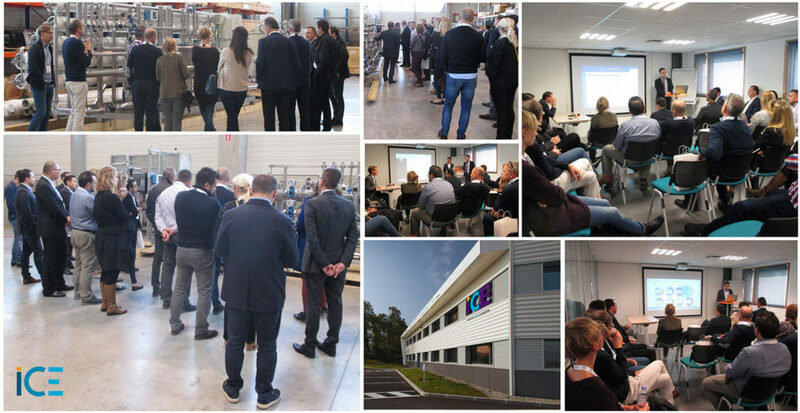 Olivier Pascaud, Sales director, and Damien Jacquet, Chief Operating Officer guided 2 delegate groups allowing them to discover some of our machines: reverse osmosis, CIP, distribution, UV, and filtration. After the visit, Evangelos Trogadis, QHSE director and Ioannis Negkas F&B expert, gave a lecture regarding “the data consolidation in your plant”. On Tuesday, the congress will carry on at the Royal Hôtel in Evian. Speakers and professionals will take part in different conferences and subjects. ICE will be holding a booth and welcome you to stop by and speak about your water management. Find here our previous article about the Global Bottled Water Congress.